Il regista Rodney Ascher ha realizzato il documentario Room 237 sui significati nascosti dentro Shining. Il film farà il suo debutto a gennaio, al Sundance Film Festival dove è stato selezionato per una sezione fuori concorso. Hai mai visto un messaggio nascosto? Nel 1980 Stanley Kubrick fa uscire in sala il suo film horror Shining. Amato e detestato in egual misura, il film viene accolto come una pietra miliare del genere dai suoi fan, mentre altri lo liquidano come lo svogliato risultato di un regista molto al di sotto delle sue capacità. A metà tra queste due fazioni, vivono però le teorie del complotto di fan scatenati che sono convinti di aver decodificato i messaggi segreti del film, scoprendo rivelazioni sul genocidio, cospirazioni governative e l'incubo che chiamiamo storia. Il documentario di Rodney Ascher mescola fatti e finzione attraverso interviste a fan e studiosi che declamano le loro teorie mandando il film avanti e indietro scena dopo scena. Ma Room 237 parla di qualcosa di più grande dei fan di un film famoso; la sua visione comprende e mette in discussione l'intento originale dell'opera, la plausibilità dell'analisi e la funzione della critica. E infine si chiede cosa vuol dire essere un fan: perché abbiamo bisogno di cercare un significato più profondo in un film? E come cambia la vita dopo averlo scoperto? Potrebbe essere un'occasione meravigliosa per deridere i complottisti, o il loro più grande sogno bagnato. Staremo a vedere. Oggi il film è stato presentato al Sundance e un blogger riporta la seguente recensione. 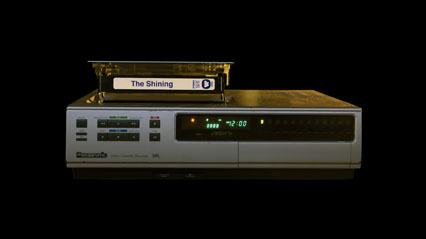 ...there are films like Room 237, which the general public may never get a chance to see. That's a real shame, because this inventive documentary/cinematic essay is one of the very best movies I saw at the festival. Essentially a feature-length version of one of those online video essays you can view at sites like Press Play, Room 237 is an exhaustive investigation into Stanley Kubrick's horror classic, The Shining. Director Rodney Ascher interviews five subjects (none of whom are seen on camera) who all have strikingly different interpretations of the movie and its ultimate meaning. One man, for example, is convinced that The Shining functions as an elaborate metaphor for the persecution of Native Americans. Another insists that Kubrick made the movie as a way to subtly reveal to the public that he was involved in staging Neil Armstrong's moon landing (note that the guy takes great pains to say that he believes NASA really did put a man on the moon... it was just the footage the public saw that was faked). Ascher uses relevant clips from The Shining to flesh out his subject's various theses, and also incorporates footage from other Kubrick films, as well as additional archival material. It's worth noting that Room 237 doesn't overtly critique or endorse any of the claims the interviewees make about Kubrick's intentions. Ascher just allows each person to make his or her case and trusts the audience to make up their own minds. For the record, I disagreed with a number of the arguments advanced in the movie -- particularly the nonsense about the moon landing -- but the pleasure of Room 237 lies in watching other people analyze a movie they're passionate about. (In this way, Ascher's film also functions as a commentary on the way individuals can twist and shape a piece of media to fit their own vision of reality.) This isn't a dry film school lesson -- Ascher turns The Shining into a kind of visual textbook that makes you eager to go back and watch Kubrick's classic again yourself so that you can form your own interpretation of its various mysteries and ultimate meaning. I truly hope that film buffs (and Kubrick devotees) everywhere will eventually have a chance to see Room 237 for themselves and the movie's producer said after the screening that they are working with a "crack team of lawyers" to investigate ways to secure the movie a wider release. (Ascher claimed fair use in incorporating The Shining footage into his film, but putting the movie out in theaters would likely result in a lawsuit from Warner Bros. and/or Kubrick's estate.) While they explore their legal options, you can read more about the film at the official website.